Loosely based on a true story, 2018’s Tag introduces us to a group of 40-something men who originally became friends as kids. One activity keeps them united: they devote one month a year to the same long-running game of Tag they began as children. Of the pals, Jerry Pierce (Jeremy Renner) stands above them all, for over all those years, he’s never been made “It”. Hogan “Hoagie” Malloy (Ed Helms) tells the others that Jerry plans to retire from the game, and this bands them together in the desire to finally end his winning streak. Going into Tag, audiences expected a wild, raucous comedy, and they got it – sort of. Despite the silliness of the concept and the many slapstick set pieces, though, Tag doesn’t pursue a constant theme of wacky hijinks. Which seems both good and bad. While I appreciate the movie’s attempts to add depth to the proceedings, these choices don’t really work. Some of that comes from the weepy nature of the dramatic elements. Though I won’t claim Tag turns into something from the Lifetime Channel, it does try a little too hard to pull the heartstrings, and these moments don’t feel especially natural. In addition, I simply think the basic nature of Tag seems resolutely “anti-serious”. It’s a movie about middle-aged men who still play Tag – why does this need to be turned into anything more than just a goofy romp? 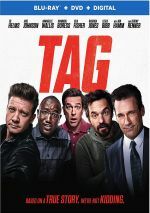 Tag does deliver a reasonable amount of comedy, at least, and it comes up with more than a few clever scenes. The extremes to which the guys go to tag each other manage funny moments and we find occasional instances of real inspiration. We certainly get a fine cast here, as in addition to Renner and Helms, we find talents such as Hannibal Buress, Jon Hamm, Isla Fisher, Jake Johnson, Rashida Jones and others. All do fine in their parts, even though some get the short shrift, especially Buress. So delightful in Blockers, Buress finds himself lost in the crowd too much of the time. All of this adds up to a mostly entertaining but slightly disappointing film. While Tag keeps us with it, I don’t think it quite manages to live up to its potential. Footnote: stick around through the end credits for an odd musical bonus. Tag appears in an aspect ratio of approximately 2.40:1 on this Blu-ray Disc. This became a pleasant presentation. Sharpness was positive. Only minor softness crept into wide shots, so the image remained pretty tight and well-defined at all times. Tag went with a teal-influenced palette that sprinkled in a fair amount of amber as well. Within the movie’s color design, the tones seemed solid. As for the DTS-HD MA 5.1 mix of Tag, it showed scope generally typical of the comedy soundfield. That said, the film’s action orientation occasionally allowed it to open up in a satisfying manner. These added a lot of immersiveness, as did a few other exteriors, but those instances remained somewhat infrequent. The mix did use the score in a broad, engaging manner, though, and the whole package fit together smoothly. Music seemed warm and lush, while effects showed nice clarity and accuracy. Bass responses delivered great punch. The mix suited the story and kicked into high gear when necessary. We find a few extras, and these open with Meet the Real Tag Brothers runs five minutes, 23 seconds. It features movie subjects Joe Tombari, Bill Akers, Patrick Schultheis, Rick Bruya, Chris Ammann, and Mike Konesky. We learn a little about the actual events behind the movie’s story and characters. We find a few decent nuggets but the program stays superficial. Eight Deleted Scenes fill a total of six minutes, 20 seconds. As implied by the running time, most offer short clips, but we get two longer ones. We see an extended bar sequence, and we also watch a flashback to the tag game’s origins. Nothing remarkable pops up but the clips merit a look. A Gag Reel goes for eight minutes, five seconds. It comes with the usual goofs and giggles, but some alternate lines make it better than most. Indeed, the final 2:30 or so consists of outtakes. The disc opens with ads for Creed II and The Meg. No trailer for Tag appears here. A second disc presents a DVD copy of Tag. It includes “Meet” but lacks the other extras. Blessed with an inspired concept and a great cast, Tag should’ve been a comedic home run. Instead, it’s maybe a double, as the movie entertains but doesn’t manage to live up to expectations. The Blu-ray offers solid picture and audio but only includes a smattering of supplements. Though never a great film, Tag boasts reasonable amusement.